Explore the 4 magical kingdoms and enjoy pinktastic activities from making magic wands and glitter jars to playing fun and exciting games at the #DreamtopiaFestival! 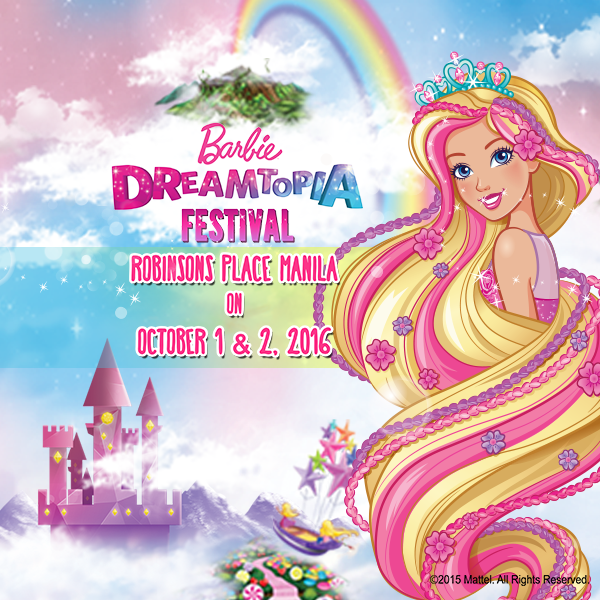 1) Purchase any Dreamtopia merchandise at participating stores from September 1 to October 2, 2016 and present proof of purchase at the Robinsons Place Manila Activity Area on Oct 1-2, 2016.
a) Create your own magical wands and colorful accessories at the Rainbow Cove. b) Get your nails done or your face painted with fabulous glittery creations at the Sparkle Mountain. c) Try your luck and roll the giant candy dice for a chance to take home lots of sweet treats at the Sweetville. d) Design your own floral headpieces or get your hair styled like a princess at the Endless Hair Kingdom. 3) Come in your best Barbie Dreamtopia costume (a Barbie Fairy, a Barbie Princess, or anything magical you want to be) for a chance to walk the runway on Oct 2! Open call starts at 2pm.